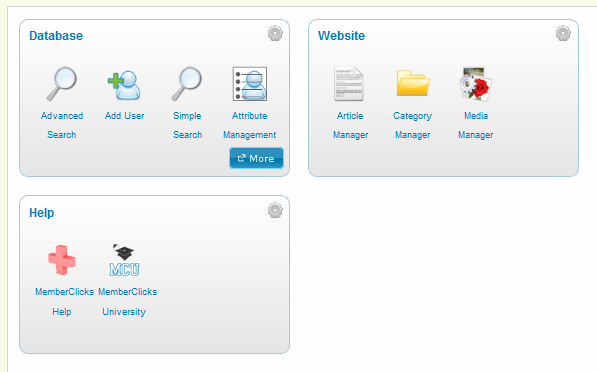 You can access the admin home page by logging into MemberClicks as an administrator. The administrative login for your site is unique; please contact the MemberClicks Help team if you do not know the administrative login web address for your site. After you log in, the first screen you will see is the admin home page. If you want to access the admin home page from another area in the back-end, simply click Admin Home in the blue administrative header. The admin home control panel is customizable so you can add quick links to the features you use most. To add or edit items in the control panel, click "New" or "Edit" in the top right hand corner of the admin home page. Click here for more details. Admin Home Statistics: Displays information about database groups and user profiles and provides access to view active form, community features and package limit information. Locked Users: This will display a list of users who are locked. Profiles are locked after a user enters the correct Username but the incorrect Password 6 times. A user will be auto-unlocked after 1 hour, but can be unlocked manually by an Administrator in this section.